In the last five days, the rescuers have been able to recover only three helmets. 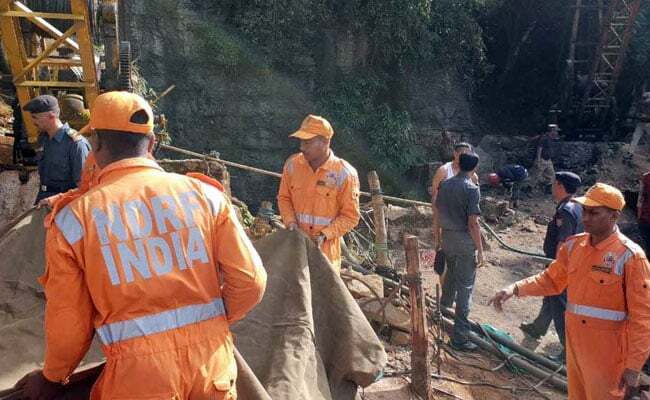 Five days after the search began for 13 miners trapped inside a "rat-hole" mine in East Jaintia Hills of Meghalaya, the rescue team hasn't been able to find anyone. And now, a well-placed source in Meghalaya government has confirmed to NDTV that at least 18 miners are trapped inside the mine whereas the authorities claim they have got to know about one more miner only. "Another miner is missing and he should be in that mine. His name is Abdul Kalam Sheikh. He is originally from Magurmari of West Garo hills. This now makes it 14. We are trying to ascertain if there are more people trapped," East Jaintia Hills Superintendent of Police Sylvester Nongtnger told NDTV. The miners were trapped inside after water from multiple channels entered the 350-ft mine. As water is still entering the mine, rescue operations have become extremely difficult, sources said. On Monday, water was still 70-foot-high when the divers of National Disaster Response Force (NDRF), which is leading the operation, entered the mine. But they could dive only up to 30 feet. A team of experts from Coal India limited has also rushed to help the rescue team. But in the last five days, the rescuers have been able to recover only three helmets. Three pumps are operational at the rescue site to pump out water. The government would acquire more pumps to ramp up operation, an official source said. Meanwhile, the NDRF have deployed divers with SONAR devices and high-caliber lights. "The water is still gushing inside the mine, which has been the biggest hurdle. We are also not aware how many channels are there inside the mine since there is no map available. This is making the operations very challenging. The space beyond the shaft of the mine is extremely narrow. The main concern is to pump out the water first," SK Shastri, the commandant of 1st battalion of NDRF told NDTV. His battalion has undertaken many successful operations in the past across northeast, but this one has proved to be the most difficult.